If you are thinking about getting a gutter system or updating your current system, seamless gutters might be for you and your home. While other gutter alternatives can become a hassle seamless gutters are designed to be efficient and cost effective. What is a seamless gutter? Using a gutter formation machine, designers are able to fabricate a seamless getter using a gutter machine which bends and forms a roll of aluminum metal into a gutter. This process allows designers to create gutter systems that are custom designed to fit to your house. The benefit of having no seams means no leaks and a clean look. What gutter material is best for my home? While your options will likely include aluminum, copper, galvanized, galvalume, and gutters of various colors and shades, it will depended solely on the design of your house and what you are looking for. Of course the most expensive gutter systems will be those made form the most expensive metals such as copper—although this often proves to be one of the most durable. It will depend solely on your interests. Often it is best to take sample pieces of gutter systems from the hardware store to your home and compare against the side of your house which color, style, or metal looks best and is right for you and your home. What looks good on paper or in a magazine may not actually look good in practice. Therefore, utilizing samples will ensure that you make the right purchase for your gutter system. How long will installing the gutter system take? Of course the answer to this question will depend exactly on the scope of the project. If you are just preparing a gutter system it could be finished in a few hours or in one day. 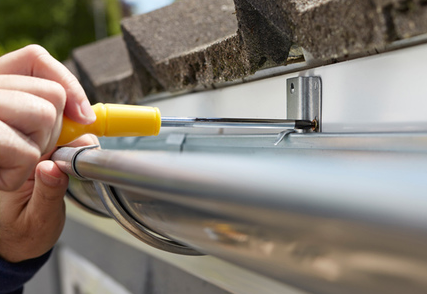 However if you are installing an entirely new gutter systems and uninstalling an old one, it could take a bit longer or even several days for larger projects. These factors also depend on the size of the home and type of material that the home is made out of (wood, stucco, etc.). This can make it more difficult for those installing the gutter system to drill holes with screws to mount the gutters. Can you repair gutter systems? The simple answer is yes! Gutter systems are difficult to repair when broken but not impossible. It will be easy when updating you gutter system to fix sagging or poorly pitched gutters, while other more drastic issues may require reinstalling large sections of the gutter. Many homeowners experience their gutters rusting up or corroding. This can sometime mean holes have formed throughout the system simply because of decay. Issues such as these can only be resolved if the gutter is replaced. Investing in a more durable metal will ensure a longer life for your gutter system. Coast to Coast Seamless Gutters can answer these and any other questions you might have regarding your current gutters or installation of new gutters. We service Fort Lauderdale, Davie, Hollywood, Boca Raton, Pembroke Pines, Miami, and all of South Florida. Call us or schedule a free estimate!